There are some adverts you watch and you think how did you come up with this?! They generally come from a difficult brief for difficult products to market – perfumes are one. I never understand the adverts for the perfumes, but as my fiance put it “how else do they get your attention for a product you can’t smell?” one point to him. They have to go to the other extreme to get us to watch it and remember it. but this product is well, hard, but definitely not as mainstream as perfume! Some days you wish you could be a fly on the wall and one I would put on my list s to be in the meeting where they came up with this! It’s very well done, and puts humour in to make it less embarrassing, hats off to the actor to be able to do it so well! #squattypotty to the rescue! A lesson in being sneaky from DHL! Getting their competitors to deliver a large black box to hard to reach addresses. What they don’t know is the box is covered in thermoactive foil. When taken to places with the correct temperature the box changed colour to reveal a giant “DHL is Faster” slogan on the box. Paranormal Activity films are meant to be pretty scary, I wouldn’t know I don’t do scary films! But I do enjoy watching people GET scared by things. This one is a great example of a fun prank on unsuspecting people. The house from the first Paranormal Activity film was “put on the market” with the previous owners giving no reason why they left in short notice. The trusting house hunters are about to find out why they left! A bit of fun to start your Friday off! If you enjoyed that then you’ll love these other prankvertising examples, like this haunted apartment which possibly inspired this version, this elevator prank, and this great coffee shop telekinesis prank. Have a giggle to start your weekend! This went round on Facebook the other week, but it turns out it’s an oldie! An oldie but a goody! French Contrex set up a row of bikes in front of a building. No signs. But as soon as curiosity won out one woman, others joined in and you can tell from the video they were pleased! So funny, I’ve never seen women so enthusiastic about exercise! Priceless moment when one lady even takes a break and makes her husband get on and spin! The harder they pedal the more they see, and it works! 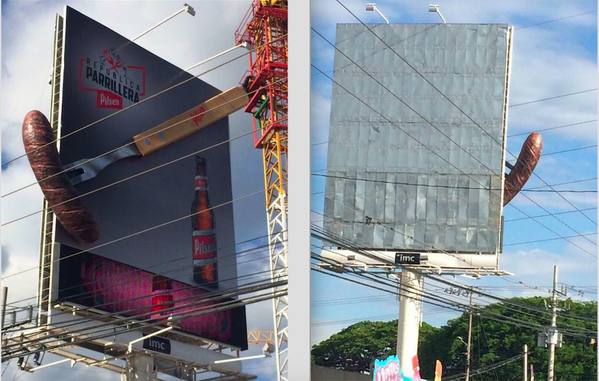 Not seen this good an example of a bad ad for a while, this is the front and back of a billboard from Republica Parrillera in Costa Rica, uploaded to Reddit. Not much forward thinking going on when they put this up was there?